For the 2014 horror film, see Parlor (film). A parlour (or parlor) is a reception room or public space. In medieval Christian Europe, the "outer parlour" was the room where the monks or nuns conducted business with those outside the monastery and the "inner parlour" was used for necessary conversation between resident members. In the English-speaking world of the 18th and 19th century, having a parlour room was evidence of social status. Parlour derives from the Old French word parloir or parler ("to speak"), and entered English around the turn of the 16th century. In its original usage it denoted a place set aside for debating people, an "audience chamber". It was the function of the "outer parlour" as the public antechamber of the monastery that was adapted into domestic architecture. In the early modern period homes became larger and concepts of privacy evolved as material prosperity was more widely shared. Rooms were increasingly set aside for the reception of guests and other visitors, screening them from the rest of the home. 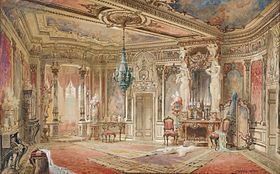 Although aristocratic homes might have state rooms, the frequent name for this reception room among the emerging middle classes (not likely to host state functions or royalty) was the "parlour". In the English-speaking world of the 18th and 19th century, having a parlour room was evidence of social status. It was proof that one had risen above those who lived in one or two rooms. As the parlour was the room in which the larger world encountered the private sphere of middle class life (the family's face to the world) it was invariably the best room (it was often colloquially called that) in the home. 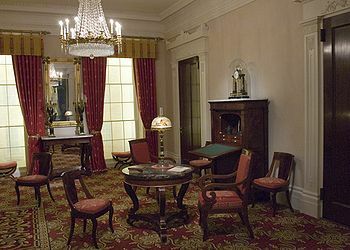 The parlour frequently displayed a family's best furnishings, works of art and other status symbols. The parlour was used for receptions around formal family occasions such as weddings, births and funerals. Some tradespeople used the parlour of their houses (or later houses bought for business specifically) in the service of their businesses. Hence, funeral parlours (for those who wished to lay out their deceased in a grander style than their own home), beauty parlours, and the like. In the 20th century, the widespread use of the telephone and (later) automobiles, and the increasing casualness of society led to the decline of formal reception rooms in domestic architecture in English-speaking countries. The secondary functions of the parlour for entertaining and display were taken up by various kinds of sitting rooms, such as the living room (chiefly in North American usage), or the drawing room (chiefly in British usage). Despite its decline in domestic architecture, the term parlour continues to have an afterlife in its second meaning as nomenclature for various commercial enterprises. In addition to "funeral parlour" and "beauty parlour" (mentioned above), it is also common to say "betting parlour", "billiard parlour", "ice cream parlour", "pizza parlour", "massage parlour" and "tattoo parlour". Less common uses include "beer parlour", "wine parlour", "spaghetti parlour", and "coffee parlour". The dialect-specific usage of this English term instead of another (i.e., as opposed to "ice cream shoppe" or "pizzeria") varies by region. ^ Kroetsch, Robert (1998). What the Crow Said. University of Alberta. p. 100. ISBN 978-0-88864-303-2. ^ "The Wine Parlor at St Francisville". ^ Litwin, Val; Bratseth, Chris; Stokes, Brad; Hanson, Erik (2004). Cool to Be Kind: Random Acts and How to Commit Them. ECW Press. ISBN 978-1-55022-652-2. ^ "Mister Ridley's Ice Cream and Coffee Parlour". Trip Advisor. Retrieved 19 March 2017.